Note: Essential has default views only. You can't modify them or create custom views. 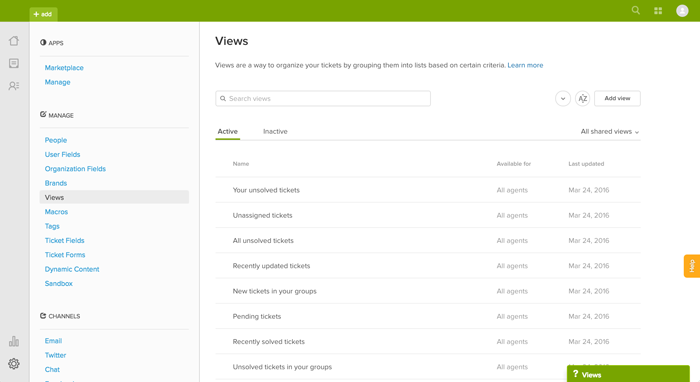 Views are a way to organize your tickets by grouping them into lists based on certain criteria. For example, you can create a view for unsolved tickets that are assigned to you, a view for new tickets that need to be triaged, or a view for pending tickets that are awaiting response. Using views can help you determine what tickets need attention from you or your team and plan accordingly. Default views. There are a number of pre-defined views created when you open a Zendesk Support account. You can deactivate or edit most of these views; however, the Suspended tickets and Deleted tickets views cannot be edited or removed from your list of views. Note: On Essential you have default views only. You cannot modify default views and you cannot create custom views. Shared views. Administrators can create views that are available to all agents or to all agents in a specific group. The first 12 shared views are accessible in the Views list ( ) . Personal views. Agents can create views that available to themselves only. The first 8 personal views are accessible in the Views list ( ). Tip: Zendesk automatically archives tickets 120 days after they are closed. Archived tickets are not shown in views. This helps views to display faster, especially those that include multiple tickets which have been closed for a long period of time. For more information about archiving tickets, see About ticket archiving. Many support teams use views to guide the workflow by requiring agents to address tickets in one view first and then others in a specific order. Views can also mirror the support structure you've created. For example, if you provide different levels of service for different customers or manage escalation using a tiered support group structure (Level 1, Level 2), you can create views for each of these scenarios. Click the Views icon ( ) in the sidebar, then select a view from the list. The first 12 shared views and the first 8 personal views are accessible in the Views list. Views appear in the list even if they currently have any tickets. You can access views that don't appear in your Views list from the Views Management admin page. For more information about using views, see Viewing tickets. Tip: If you want certain views you use frequently to appear higher on the list, you can reorder your views. Click Admin icon ( ) in the sidebar, then select Manage > Views. You can browse or search for a view. All of your available views can be managed through the Views management page. Views are divided by activation status. The default view on the Views management page is the list of Active views. You can view views that have been deactivated by clicking the Inactive tab. For more information on activation status, see Deleting and deactivating views. All views containing the search term appear in the list. Agents can create views for their own personal use. Administrators can create personal views, as well as shared views for use by multiple agents. Community tip! Graeme shares real-world best practices for setting up and using views in this community tip, Views best practices. On the Views management page, click Add view. Add the conditions to define this collection of tickets (see Building view condition statements below). You can test the conditions by selecting Preview match for the conditions above. Set the formatting options (see Setting formatting options below). Set the view's availability (see Setting a view's availability below). You can also manage views (edit, deactivate, and so on) on the individual view's page. On the Views management page, click the view you want to work with, and modify it as described above. As with the other business rules, you select collections of tickets using conditions, operators, and values. Some conditions may not be available, depending on your plan. New is the initial status of a newly created ticket (not assigned to an agent). Open means that the ticket has been assigned to an agent. Pending is used to indicate that the requester has been asked for information and the ticket is therefore on hold until that information has been received. On-hold means that the support request is awaiting a resolution from a third party—someone who is not a member of your support staff and does not have an agent account in your Zendesk. This status is optional and must be added to your Zendesk (see Adding on-hold ticket status to your Zendesk). Solved indicates that the customer’s issue has been resolved. Tickets remain solved until they are closed. Closed means that the ticket has been locked and cannot be reopened or updated. Status is less than Solved. Ticket: Form Select the required ticket form. For more information on ticket forms, see Creating ticket forms to support multiple request types. Incident is used to indicate that there is more than one occurrence of the same problem. When this occurs, one ticket is set to Problem and the other tickets that are reporting the same problem are set to Incident and linked to the problem ticket. There are four values for priority: Low, Normal, High, and Urgent. (—), which indicates that no group is assigned to the ticket. (current user's groups), which includes all the groups to which the agent viewing the view belongs. (assigned group), the group assigned to the ticket. Group name, the name of the group that is assigned to the ticket. (—) indicates that the ticket is unassigned. (requester) is the ticket requester. You can select this option to return tickets that were opened by and then assigned to the same agent, for example. Agent name is the actual name of the person assigned to the ticket. (current user) is the person who is currently viewing the view. For example, if the view condition was Assignee > Is > (current user) then the agent viewing the view would be shown all the tickets for which they are the assignee. This enables one view to show relevant tickets to each agent, without having to create a specific view for each individual agent. (assignee) is the person assigned to the ticket. The condition statement ‘Requester is Assignee’ is true if the requester is also the person assigned to the ticket. This is possible if an agent created a ticket and was then assigned to it. Agent name is the actual name of the agent. (current user) is the person currently looking at the view. If you are looking at the view, you will see tickets for which you are the requester. (—) indicates that no organization has been added to the ticket. Organization name is the name of an organization. You use this condition to determine if tickets contain a specific tag or tags. You can include or exclude tags in the condition statement by using the operators Contains at least one of the following or Contains none of the following. More than one tag can be entered. They must be separated with a space. Ticket: Description The description is the first comment in the ticket. It does not include the text from the subject line of the ticket. If you are using the Contains at least one of the following or Contains none of the following operators, the results will consider words containing part of the entered search terms. For example, using "none" for this condition will return (or exclude) ticket descriptions containing "nonetheless". The ticket channel is where and how the ticket was created. For a list of the available ticket channels, see How are ticket channels defined across Zendesk? Ticket: Received at This condition checks the email address from which the ticket was received. The ticket can be received from a Zendesk email domain such as sales@mondocam.zendesk.com, or from an external email domain such as support@acmejetengines.com. The external email domain must be set up as described in Forwarding your incoming support email to Zendesk or the condition won't work. Note: If you are on Enterprise and have multiple schedules, views based on business hours will use your default schedule (that is, the first schedule in your schedules list). In a upcoming release, this will change so that views will use the schedule that is applied to the ticket. Ticket: Custom fields Custom fields that set tags (drop-down list and checkbox) are available as conditions. You can select the drop-down list values and Yes or No for checkboxes. Note: Each custom checkbox field must have an associated tag. Otherwise, when you create or edit a view, it will not appear as an available condition. Requester: Language Returns the language preference of the person who submitted the request. You can decide what ticket data to display in a view, how the tickets are grouped and ordered, and how many tickets are listed per page. There's a List style view and a Table style view. Select the Table formatting option. Drag the table columns you want to include into Columns included in table. You can add up to 10 columns. Status is always shown in the view before the columns. You don't have to add it manually to the table. Note: Multi-select fields are not supported in table columns. Select the ticket data field you want to use as the default data to order the tickets in the view. You can select Ascending or Descending. Select the ticket data field you want to group the tickets in the view. You can select Ascending or Descending. When an administrator creates a view, they have the option of setting who can access the view. They can create a shared view, available to all agents, or they can create a personal view. Professional and Enterprise administrators have the additional option of creating a shared view that's limited to a specific group. Note: The Agents in group option is only available in the Professional and Enterprise plans. You can edit and clone views. Cloning a view creates a copy that you can modify and use for some other purpose. If using custom roles, agents will need to be permitted to add and edit personal, group, and global views (see Creating custom agent roles). Agents will receive an error message if not given the permission. On the Views management page, locate the view you want to edit. Hover your mouse over the view to display the options menu icon ( ). click the icon and select Edit. use the drop-down menu to select Update, then click Submit. Click the Views icon ( ) in the sidebar, then select a view. Click the View options menu in the upper right. Click Edit. The View edit page is displayed and you can modify the view as needed. 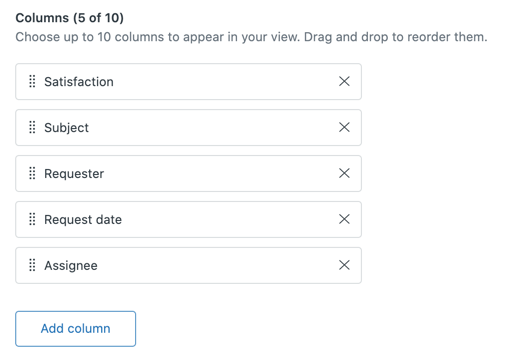 On the Views management page, locate the view you want to clone. Click the options menu icon and select Clone. Click the down arrow next to the title of the view. Click Clone. A copy of the view is displayed in the View edit page, and you can modify the cloned view as needed. You can share a permanent link to a view in emails or web pages. Normal access permissions apply to the users who click the link. See Setting the view's availability. Agents can only share personal views. On the Views management page, locate the view you want to share. Click the view to open it. Copy the permanent link in the upper-right side and use it in an email or a web page. If you want certain views you use frequently to appear higher on the list, you can adjust the list order. Agents can reorder only personal views, while administrators can reorder both shared and personal views. You can only reorder views on the same page. 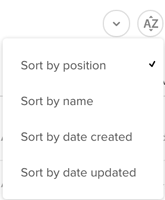 If your views list is more than one page, you may need to change the sorting order of the list to reorder them in the way you want. If your list is filtered by a specific group, you may not be able to reorder it. On the Views management page, click the options menu icon . Click and drag the names of views to adjust the order. On the Views page, click the Sort by icon ( ) to open the menu. Select the property you want to use. The views are reorganized based on that property. You can filter the list of views by the availability applied to them. Click the All shared views drop-down menu. All shared views, views shared with any of your agents. Views shared with all agents, views that are available to all of your agents. Views that are restricted to a subset of agents will not appear. Personal views, views available only to you. Views available to specific groups, a list that varies depending on the groups you have shared your views with. Return to the unfiltered list by clicking the drop-down menu and selecting All shared views. If you decide that you no longer need a view you can either delete it or deactivate it. Deleting it of course means that it's gone and can't be retrieved. You can instead deactivate views. Deactivated views are listed in a separate table on the Views page and can be reactivated if needed. On the Views management page, locate the view you want to deactivate. Click the icon and select Deactivate. The view is moved to the Inactive tab. To reactivate the view, select it from the list of inactive views and select Activate. If you decide to permanently delete a view, you must first deactivate it as described above. On the Views management page, click Inactive. Locate the view you want to delete. Click the icon and select Delete. You can export a view to a comma separated values (CSV) file. The CSV file will contain an entry for each ticket and all its associated ticket information in the view. Note: Because of the processing involved in generating a CSV file, you can export a view only once every 10 minutes. If there is less than 10 minutes between requests, you will receive an error message. Community tip! Check out Serge's community tip for exporting views in our Community. You'll receive an email notification containing a download link for your CSV file. The email is sent to your primary email account in your user profile. Tip: Larger views might fail to export, even though they display correctly in the Support console. If you don't receive an email with the download link, consider modifying the view to return less information, or using the Zendesk API to retrieve the information you need. Is there any way to use properties of the user/organisation rather than the ticket to create views? Thanks! Only ticket properties are available for the filters in Views. Can you tell me more about what you're trying to do? Maybe we can come up with an alternate solution. @kathryn, as Jessie said the answer is no however if the user/org field has a tag associated with it then you could mirror that field to the ticket also by using the same tags. For example, have a support level custom field on the user and add the same field with the same options and tags to the ticket. The field on the ticket will be updated when the ticket is created. Note that it is not updated any time after. @colin: That's what I was thinking too. It's a shame to clutter up the ticket view & create all that mapping when the information already exists on the org level though. @jessie: An example of information we'd like to see on a view, but which resides on the organisation object, would be subscription type (e.g. Enterprise, Free...). Seeing it is in a view is useful because it provides our agents and their managers with a snapshot of the queue, helping them to identify trends and allowing them to prioritise certain tickets (if need be). @Kathryn, you can always hide the ticket field. That bit is simple with the Ticket Field Manager app. @Colin Thanks for the suggestion - I'll try that! Not sure if anyone already ask this and my use case is I want to identify how many tickets is assigned to an agent? So we have a custom view (or you can click on the Agents dashboard) and the, when you look at Open, Pending, and Solved status tickets, you need to manually count it. I would like to be able to hide views that do not belong to the user's default group. How do I achieve this? In order to re-assign tickets a user needs to be part of both groups. However I would like to have different views for each group, and hide the views that are not relevant to that group, so there should be an option to only show views that belong to the users default group. Now the tickets live in the two first groups, but the views live in the two last. That way your agents can freely reassign because they are in both groups with tickets, but can only see the tickets you want based on the views you create for the two ghost groups. You can then use the Assignment Control App to hide the two last groups from the agents screen. Not sure if anyone has already asked this but I've noticed when you create a view, this won't show any archived tickets? Does anyone know how to get archived tickets to show? Archived tickets do not appear in ticket views. This is by design. If you need to extract lists that include archived tickets, you are best using a reporting tool such as Insights or the API. The new Zendesk shows me two pages with active Views, and I was about to reordering them when I find out that I can only do so per page. Exemplifying: I can't to bring the last view (bottom of 2nd page) to the top (top of 1st page). I created a simple view (filter only on Org). in the view i have only 50 cases whereas i have 177 case? I'm sorry, I'm afraid I don't entirely understand what you're asking. Are you talking about one View, or multiple Views? In order to optimize performance in the agent interface, closed tickets are archived after 120 days. Archived tickets are still available via Search, but they don't load up in Views. This keeps the system from getting bogged down trying to load thousands and thousands of old tickets. Most likely, this is why some of those tickets aren't showing up in your View. I think there must be a translation tabel, because when I switch language the name of these variables also changes. Another issue is that on mobile devices the views are in english, can I change this? If you'd like to change the title of a View based on language, you can use Dynamic Content. Using dynamic content, you'd create the translations and then use the dc placeholder in the View title. This will then display depending on the language selected in the agent profile. This will also work on the mobile app. However the mobile app does not follow the user profile language from what I am seeing on my iOS device. Instead, the Support mobile app will display in whatever language your phone is set to. If you update the View using DC, be sure to completely logout and quit the mobile app to see the View title changes in the language set on your device. Is it possible to hide views which have no tickets in it? Now the view only gets grey. After sorting the view by name - the view are sorting the view order is not saved. once we close and open the browser it doesnot retain the sorted order. How do we save the sort order so that the views show up like how we sorted. Every View has a default sorting order. You can change it, by changing the default sorting as an admin in Zendesk - Look under Admin -> Views. Click the view you want to change and look for Sorting Order. Hi guys, is it possible to order a view by priority and , after that, by request date? At the moment, we order by priority but then the tickets that was sent last is higher than the ticket that was sent earlier. We would like to first have all the high priority tickets but with the oldest on top. We would then want t have the normal priority tickets, once again with the oldest on top and same for low priority tickets. We do this by grouping by priority and then ordering by created date. Also, since the group name will be shown at the top of each group, then you can probably save a column in the view by not including the priority since it would be redundant info on the page. Hi Ricardo, when you say grouping by priority, do you mean that you separate different priorities in different views? How do you group tickets by priority? Thanks so much! There are two options at the bottom of the view setup screen: Group by and Order by. Below is a screenshot of what we use to group the tickets in the view by priority and we ordering this view by Request date (both descending). One of our users is able to export CSVs for a particular view, but never receives the email with the link. "When I do the function, it gives me a confirmation that it will be sent to my email address, but I never receive the email." He is able to receive the export of other views. When he re-creates the unexportable view using the same parameters, they, too, cannot be received via export. Other members of his group are able to receive the CSV export from this view, just not this agent. I see that you were actually able to get assistance with this in a ticket! In case anyone else is experiencing a similar issue, Amy and Drew were able to figure out that the email was being sent and received successfully, but was being routed away from the user's inbox by a keyword filter, so they weren't able to find it. Is it possible to create a view based on the content of the internal comments? My intention is to create different views for our pending tickets, which can be pending for any number of reasons. My agents always write the pending task as an internal comment and based on those comments I could very easily sort them into different cathegories. Sadly, the condition "Ticket description contains XYZ" does not work, because it only takes into account the first comment in the ticket (which is the body of the customer's E-Mail) and never the internal comments. In my case, I use ticket tags for documenting contact reasons, so managing the new views via adding new tags for a different purpose would totally mess up my statistics. Do you know any other way I could solve this? Hi Marie! Welcome to the Community! I think the easiest way to do this would be to create macros for the different tasks your agents are adding to the tickets. All you'd need to do is make sure that each task has a tag associated with it that's added by the macro, and you can create views based on those tags. We have a specific need for View order, which by the looks of it is not possible in the current setup. As we have tens of agents working in a single shift (assigning, unassigning, replying on, or solving tickets) the order by simply "latest update" isn't realistic because if the ticket arrived outside some agent's shift and it took someone 45 minutes to unassign it, it will be perceived as just updated even though it is already open for 45 minutes (people won't assign it until it's next in line again). Are we able to order the tickets by the latest public comment made specifically, so the View order ignores updates without an actual comment? We agree that assigning, filling ticket fields and etc. are updates on a ticket, but they are irrelevant to client - support communication, as with 'group by: latest public comment' we would know exactly how much time each ticket is open on our side without a reply from either side. Hopefully this is something that can be added to View settings without a need for a workaround though macros, or triggers. There is a column "Updated by Requester" that might work for you. You can sort on that field as well.